There’s this fellow who calls himself The Heresiarch. He has a blog, and you can find him on Twitter. I’m not sure what he thinks his heresy is, but on his website he states that he’s into “countering complacency, received opinions and incoherent thoughts”; further, that he “continues to campaign against all form of orthodoxy”. Speaking truth to power, I guess; a noble cause. So how’s that going? Sounds pretty bad. So what is the story actually about? Well the headline is as clear as the Daily Mail can be. But that’s just the headline. What about those all-important bullet points? Oh no. Looks like we have another Twitter joke trial on our hands. Except there’s no reference here to Twitter. At least not yet. But let’s not split hairs; onto the article itself. So far, so bad. The Heresiarch (let’s call him H to save time and spellchecking) is rightly miffed that the police – or should that be the “thought police” – are a bunch of PC twats (geddit! ), running around now that Mandela has died and arresting people for innocent if not-very-good jokes that they made some months ago. Haven’t they got anything better to do? Sadly, though, this is the high water mark of H’s “analysis”. Oh. So still no mention of Twitter (don’t look, it isn’t there, not anywhere) and now we find that this whole thing happened months ago, and that it’s not just the police acting now on a comment from September. Is this news in December? Well the Mail certainly thinks so. one of two men interviewed by police following a bitter, ill-tempered feud over plans for a mining memorial in the town centre has been ambushed by some members of the Far Right and used as a propaganda platform. 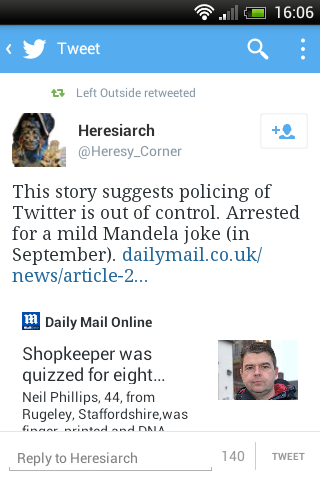 So, perhaps not just arrested for making some mild jokes, do we think? “Cheadle, Greater Manchester”? Hey, that’s where I live. Perhaps I can pop round and find out the unadulterated truth behind the sorry affair? Sadly I suspect they mean the Cheadle in Staffordshire, what with everything else in this tale being Staffordshire based. Still, that likely lazy journalistic error is far from the most important thing here. More important is that “threats” and “jokes” are not the same thing, at least according to the law, and so the introduction of this second, threatening man makes the waters ever muddier. In fairness to Mr Phillips, though, we can’t hold him responsible for Mr Christopher’s threats, now can we? All Mr Phillips did was copy a few harmless one-liners. Who could possibly be offended by that? Liberal Democrat Councillor Tim Jones was so incensed by the one-liners, aired at a time when Mandela was critically ill, that he made an official complaint. Ah, the guilty party. So it seems that Councillor Jones could be offended. He’d better have some pretty hard evidence to back up his obvious overreaction. What does he do? He then sent the Sunday Mercury – a Birmingham-based newspaper – screen grabs. One was of a shocking image of decapitation, another featuring a wheelchair-bound individual, both posted by Mr Phillips. Hmm. Whatever the rights and wrongs about Mr Phillips’ arrest, I think we’ve strayed a little way from believing it was all because of him making some mild jokes, as the Mail initially suggested and which The Heresiarch credulously accepted. Okay then, so time to wrap this up. I could get mad with the Daily Mail here, but what can you expect? There’s nothing especially unusual about this as far as they’re concerned, it just follows their standard MO: there’s that bold headline, followed by the slightly more equivocal opening paragraph, then by the time you reach the end you find that the whole premise of the article has been pretty much denied. But, to be fair to the Mail, should you read the whole article you should at least have a fair idea about the truth of the matter. Unless you’re already tapping away on Twitter by the time you get that far. If you even do get that far. 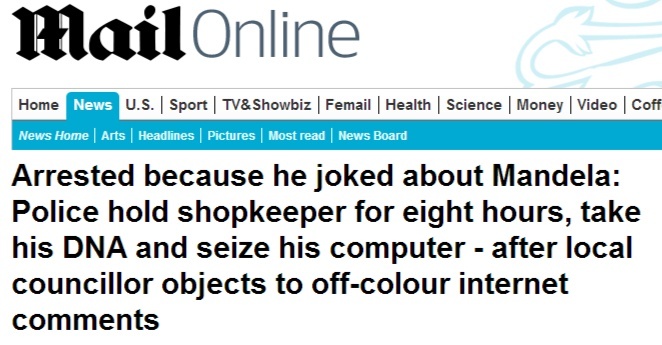 Because I find it impossible to believe that you can read the whole article and come away thinking that someone has simply been arrested for making an off-colour joke. Forget analysis. Hell, don’t even bother with basic comprehension. To come away thinking that someone has been arrested for making a joke means you either haven’t read the article, or I don’t even think you can read. All of which suggest that The Heresiarch really is the Daily Mail’s ideal customer. Which is fine. There are over 600-odd comments at the moment on the story, and no one else seems to have read it fully either, so H has plenty of company. And, in fairness, after being challenged, he has now deleted the tweet in question, although to the best of my knowledge he hasn’t refuted it. But you have to wonder how this all fits in with “countering complacency, received opinions and incoherent thoughts”. Does it really rate as speaking truth to power if while you think you’re railing against the powers-that-be you’re actually just dumbly falling hook, line and sinker for the usual Daily Mail copybook scare tactics because they happen to bolster your world view? Well I don’t think it does. So thank you, Heresiarch, for bravely standing up for what you believe in; but should I ever again stumble upon your work then I think I’ll jog on. And next time I feel the urge to read an alternative viewpoint which challenges the orthodoxy, at least now I know that I’ll have to look elsewhere.